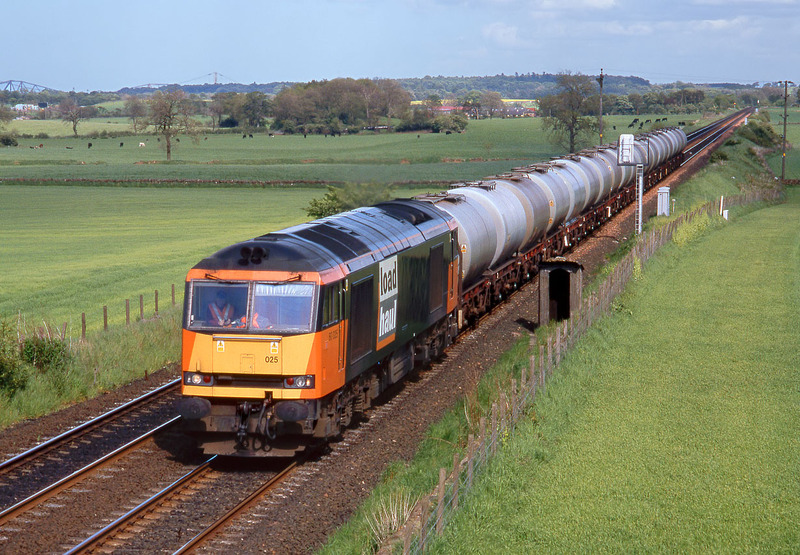 60025 approaches Linthigow on 24 May 1999 with the early running Mondays only 6N71 17:05 Linkswood to Mossend oil empties. This service provides aviation fuel for RAF Leuchars. Note the two Forth bridges on the horizon. Although this looks like a pleasant spring day, there was in fact a terrific gale blowing and it was all I go do to keep the camera steady and pointing in the right direction. Also the shadow just behind the train was traveling up the line faster than the 60, so I was lucky to get this in the sun!